MiX Fleet Manager Premium has helped Triunfo Concebra to reduce their fleet’s fuel consumption by 8%, overall maintenance costs by 16% and road accidents by 80%. When Triunfo Concebra, a Brazilian-based highway concession company, required a more efficient and less costly way to manage their busy fleet of 300, they turned to the MiX Fleet Manager Premium solution. This sophisticated solution has been closely monitoring both vehicle- and driver-related activities, which has led to, among other things, an impressive decrease in fuel consumption, maintenance costs and road accidents. MiX Fleet Manager Premium, a sophisticated telematics data collection and analysis tool, has been helping to measure the movements of Triunfo Concebra’s drivers and vehicles. In particular, the system has been used to look at metrics like speeding, braking, acceleration and more to see where improvements can be made. After using the system for only three months, a reduction of 8% (approximately 7,500 liters) in fuel consumption was seen. This, in turn, has led to a decrease in the amount of air pollutants produced by Triunfo Concebra, a definite win for the environment. In addition to this, drivers have been made more aware of the effect their actions on the road have on others and their vehicles, something that has led to a large decrease in the amount of road accidents as well as a reduction in maintenance costs. Great service is of the utmost importance to Triunfo Concebra. With MiX Fleet Manager Premium’s on-board computers in place to monitor the fleet, the company has been able to increase their response time due to better location accuracy and ultimately deliver services more efficiently. The telematics system provides the promise of safety and optimised operational cost, and in particular, speedy service to users. 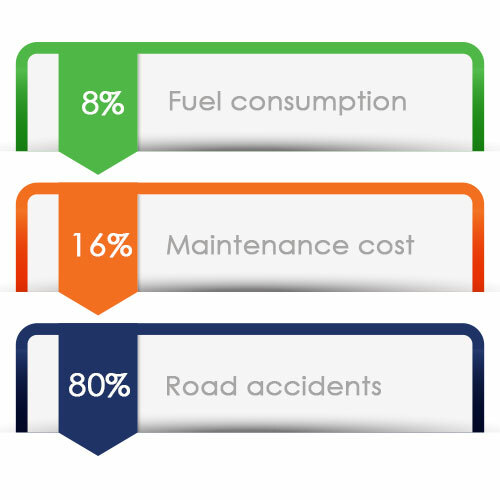 With this information, we can see our employees’ driving habits in more detail. For instance, we can know if an employee has exceeded the speed limit, if they have used harsh braking or acceleration, or even if they have used the vehicle speed limit device.